In Canvas, a course shell is where assignments, events, files, and grades are stored for a course during a semester or the duration of the course. Modules: The curriculum for the first two years of medical school at Tulane University School of Medicine is an integrated curriculum consisting of organ-system-based modules lasting two to six weeks. Disipline-based courses are integrated within these modules. Each module and each course is placed into a single Canvas based course shell. One example is the Phase II Cardiovascular Module which combines material from Medical Pharmacology, Mechanisms of Diseases, Clinical Diagnosis, Intro to Infectious Diseases, and Foundations in Medicine. Course shells for modules contain all of the relevant materials for that module, along with the calendar for the module. Students receive individual grades for each of the different discipline courses. Course shells for courses contain assignments and grades relevant to individual courses over the duration of the course. 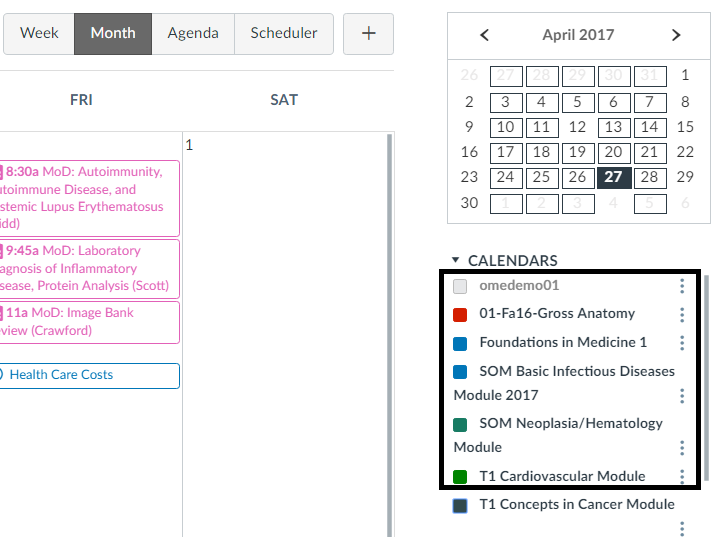 What to do in Canvas: To see the calendar for the Modules and Courses in Canvas, they must be enabled. Please be aware that Canvas only allows for up to 10 calendars to show at a time so it is important to ensure that the current module and the primary courses are selected.